Here is the assignment for the final out of class essay, which is on Hamlet: hamletpaper. I’ll post the film on this blog either later tonight or tomorrow. Claudius finds out that Hamlet has killed Polonius and, with the help of Rozencrantz and Guildenstern, tries to find where he hid the body (Scenes I-III). Claudius writes a letter to England with instructions to execute Hamlet when he arrives there and gives it to R & G, who leave for England with Hamlet (Scene III). Hamlet finds out that Fortinbras is sending an army to Poland to reclaim a small patch of land. Inspired by Fortinbras’ determination over something so small, he renews his own determination to kill Claudius (Scene IV). Gertrude is visited by Ophelia, who has lost her mind over the death of her father (Scene V). Laertes returns from France after hearing about the death of his father. He initially blames Claudius and wants to kill him, but Claudius manages to calm him down for the moment (Scene V). Ophelia returns and greets her brother, although she has still clearly lost her mind (Scene V). Horatio receives a letter from Hamlet saying that he stowed on board a pirate ship and is returning to Denmark (Scene VI). After finding out that Hamlet is returning to Denmark, Claudius tells Laertes that Hamlet killed Polonius, and the two make a plan for Laertes to take revenge on Hamlet. Laertes will challenge Hamlet to a fencing duel, but Laertes’ rapier will be poisoned. And, just in case that fails, Claudius will have a glass of poisoned wine on hand to give to Hamlet when he gets thirsty from the duel (Scene VII). Gertrude reveals that Ophelia has fallen into a river and drowned, presumably as a suicide (Scene VII). 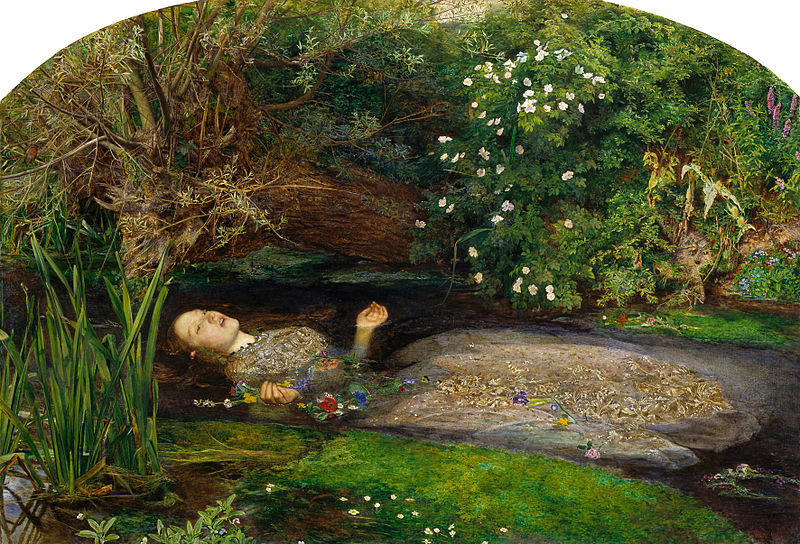 For your blog, I want you to write about why you think Ophelia’s madness and death have been such fascinating subjects for artists. How is she portrayed in these paintings? In the film? 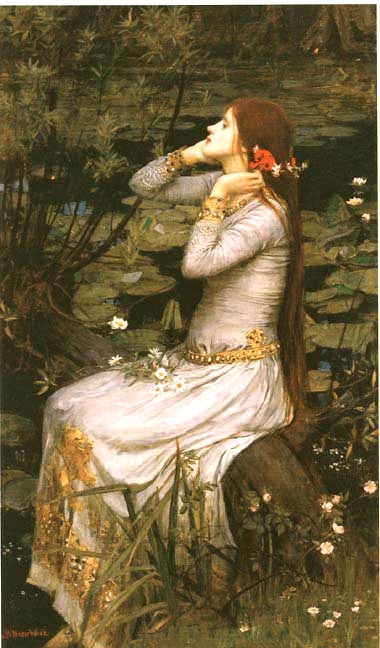 How do these visual portrayals compare to your own imagining of Ophelia? Act II of Hamlet is a relatively short one. As always, try your best to decipher the language on your own. There are plenty of websites that provide summaries and offer one-to-one, plain English translations. Those are fine to use if you’re stuck, but do try to understand as much as you can without them. Hamlet starts to act crazy, leaving everybody worried about the reason. Polonius assumes Hamlet is madly in love with his daughter, Ophelia, and that this is the reason for Hamlet’s strange behavior. He plans to spy on the two together, with Claudius, to prove his point. Hamlet’s college friends, Rozencrantz and Guildenstern, come to visit and are employed by Claudius and Gertrude to spy on him as well. Hamlet’s friends have invited a group of players to entertain him. After watching them, Hamlet gets the idea to have the players stage a show that will reenact his father’s murder. Since he’s having doubts as to whether he can trust the ghost, he wants more evidence that Claudius is actually guilty of murder. He believes that if Claudius sees this show, and he is really guilty, seeing the murder reenacted will drive him to confession. Thus, “the play’s the thing / Wherein I’ll catch the conscience of the king” (556-557). 1. Read the exchange between Polonius and Gertrude in lines 85-108 (stop when he reads the letter). Then, read Polonius’s exchange with Hamlet in lines 170-210. How does Shakespeare characterize Polonius as a comical figure in these passages? Again, try not to recruit outside help unless you’re absolutely stuck. 2. Read the exchange between Hamlet and Rozencrantz and Guildenstern from line 215-250. Note the sexual pun in lines 220-225. Shakespeare’s plays are famous for this sort of bawdy word play, which were enjoyed by all levels of society. Then, I want you to respond specifically to the exchange in lines 230-240. Summarize this exchange. Why does Hamlet say “Denmark’s a prison”? What does Rozencrantz mean about “ambition”? How might this exchange still be relevant for a young person’s concerns today? For the rest of the semester, we’ll be focusing on William Shakespeare’s Hamlet. As an introduction, take some time to read through the Study of William Shakespeare section on pages 1516-1528 in the BL. Note the illustration of the Globe Theater, where Shakespeare’s plays were performed, on page 1522. The Globe was set up so that people from all different classes of society could enjoy the plays. The more money a person could pay, the better the seating; standing on the ground were the poorest members of society. Also pay particular attention to the Note on Reading Shakespeare on page 1526. As they say, people never really spoke the way the characters do in Shakespeare’s plays. Hamlet is poetry and the characters are speaking in poetic verse. Therefore, it can be difficult to understand what the characters are saying sometimes. Follow the numbered list of tips provided to help you in understanding the play. For your blog, I just want you to write a paragraph describing your previous experiences with Shakespeare’s plays. Have you read any in other classes? If so, which ones? Have you seen any performed? If so, which ones? If you’ve read and/or seen any of the plays, what did you think of them? Did you enjoy them? How well were you able to follow them? Refer back to the presentation on sonnets for a refresher on these terms and concepts and for examples of Italian and English sonnets. 1. How is The Genius of the Crowd similar to Whitman’s I sing the body electric? How do both establish a rhythm in spite of not having a fixed form? 2. Bukowski does not use many specific images in this poem. How does this affect your understanding of the poem? What would change if he added specific images? 4. This is a didactic poem. What is it trying to teach? Do you agree? 5. What is your response to open form poetry in general? Where do you draw the line between poetry and prose? Take some time to read through the process for the sample student essay on John Donne’s Death Be Not Proud. Note how the student goes through annotation (1031-1032), freewriting (1032), and outlining (1033-1034) to organize her thoughts before writing the actual paper. Also note how the paper uses the elements of effective writing discussed in class yesterday. Finally, pay attention to how the rules for citing poetry are slightly different than for citing prose: instead of using page numbers in parenthesis, use the line number; if citing four or more lines, set them off in a block as shown; if citing less than four lines, use a / to show where the line breaks. After looking over the sample paper, read Mark Jarman’s Unholy Sonnet on 980. Then, write a paragraph comparing and contrasting the tone and theme of Jarman’s poem with that of Donne’s. This will count as one of the graded blog entries.